Silver has been used as biocide for medical purposes since the 1930s. 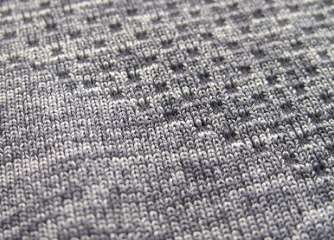 Today nanometric size silver particles are used to prevent unpleasant odour caused by bacteria in sport shirts or socks. "Nanosilver can be applied in lower quantities than other antimicrobials and hence has advantages regarding resource use and environmental loads", Tobias Walser tells youris.com. He is a researcher at the Institute for environmental engineering at the Swiss Federal Institute of Technology in Zürich. However, "the environmental and human risk of nanosilver has yet to be fully understood", he adds. As part of an EU funded project called Prosuite, Walser and colleagues analysed the environmental impact of nanosilver T-shirts during their entire life cycle, from raw material extraction to end-of-life disposal. This, according to Walser, is the first of its kind for a nanomaterial. The scientists found that the T-shirt's environmental impact during use would be reduced if they are washed less often than conventional ones, due to their antimicrobial properties. This would even compensate for a slightly higher climate footprint during production. Walser explains: "In comparison to all toxic releases during the life cycle of a T-shirt, the toxic releases from nanosilver from washing appear to be of minor relevance." Previous studies looked at single impacts of antibacterial textiles. For example, scientists found that nanosilver leaches into the wastewater during washing. According to other studies, this silver may not be that harmful to the environment because it is transformed into a nearly insoluble substance called silver sulphide in wastewater treatments. A study published by the Danish Environmental Protection Agency in 2012 did not find "specific risks" to health or environmental effects of nanosilver textiles available in Denmark. "The [Prosuite] study is an important step into the right direction," comments Bernd Nowack, an expert in environmental risk assessment at Empa, the Swiss Federal Laboratories for Materials Science and Technology. Yet, to be able to fully assess the environmental benefits of nanosilver textiles, more should be known about issues such as the industrial production of nanosilver or whether the textiles are actually washed less often. Nowack regards nanosilver as an effective biocide, with little drawbacks. "There is no strong evidence for the toxicity of nanosilver", he adds. Some experts are concerned about their environmental risks, however. The study "is very relevant" because it "gives a fingerprint" about the impact of such T-shirts, Anders Baun says. But the professor in risk assessment of nanomaterials at the department of environmental engineering at the Technical University of Denmark, based in Lyngby, considers it "a bad idea to distribute silver in the environment". He points to a study that found evidence for nanosilver accumulating in the food web based on a study of plants and animals of an experimental wetland environment. Moreover, he says, it is unknown how the coating of nanosilver influences its environmental behaviour. Baun has previously criticised the European policies regarding nanosilver and is currently enrolled in a scientific committee on the topic as invited expert. The expert group will publish its opinion later this year, he says. Another issue is that bacteria may become resistant to silver if it is widely used in consumer products. "This is a threat for medical applications", Hans-Curt Flemming tells youris.com. The Professor of aquatic microbiology at the University of Duisburg-Essen, in Germany, contends that nanosilver in consumer textiles is "plain nonsense". Walser, currently a visiting scientist at the U.S. Environmental Protection Agency, is now collecting data and conducting modelling studies on nanoparticle emissions in productions sites to improve the life cycle assessment of nanotextiles. While there is no threat to people using such textiles, this is probably different for workers in the nanotechnology industry who may inhale the particles, Walser says. "The nanoparticles can penetrate deeply into the lung" and inhalation therefore remains "the critical pathway". Even if effective and stably attached to fabrics, silver is too costly. Dissolved nanosilver or ionic silver should be no problem in sewage systems that produce much smelly hydrogen sulfide forming black insoluble silver sulfide as found naturally in soil. But silver bonded to some fibers may cause allergies in sensitive individuals like myself who noticed itching with silver coated nylon gloves.